At least 2 deaths blamed on the storm. About 6.8 million, a quarter of the Texas population, affected. Rainfall totals in some parts of Texas expected to top 1 metre. More than 75,000 calls to 911, more than 2,000 rescues. U.S. President Donald Trump to visit Texas on Tuesday. Houston Emergency Services have received more than 75,000 calls so far, and first responders have made more than 2,000 rescues amid tropical storm Harvey, which officials said remains a “dangerous and historic” storm. At least two deaths have been blamed on Harvey, which made landfall late Friday as a Category 4 hurricane and is the most powerful hurricane to hit Texas in more than 50 years. 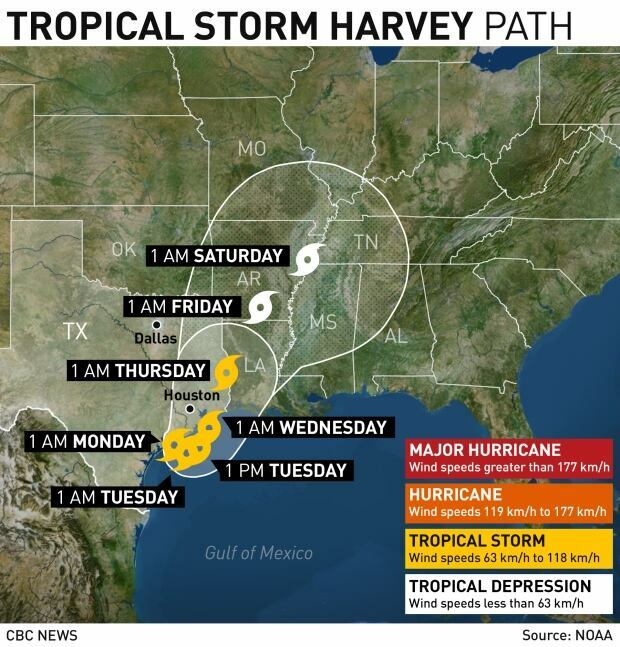 People in the path of the storm were advised to continue to shelter in place if possible, as “catastrophic and life-threatening” flooding continued in southeast Texas and made its way east toward Louisiana, the U.S. National Hurricane Center said. Long said officials expected more than 450,000 disaster victims to file for assistance and anticipate that more than 30,000 people will have to be placed in shelters temporarily. Harvey has paralyzed Houston, the U.S.’s fourth-largest city, shutting schools, airports and office buildings, as roads turned into rivers and chest-high water filled neighbourhoods in the low-lying city. An estimated quarter-million customers in the Houston area were without power on Monday morning. Mayor Sylvester Turner said the priority for Monday was to get to about 185 pending critical rescue requests. “We recognize there are many other people out there in stressful situations, and we want to get to them,” he said at a news conference. Police Chief Art Acevedo said four people had been arrested for looting and warned that police officers were on way from throughout Texas to patrol empty streets. The Coast Guard said 18 helicopters and nine boat rescue teams were out conducting search and rescue Monday. Long said in addition to search and rescue, the next objective was to “stabilize” disaster survivors. Long said the federal government was bolstering security in Texas and working to restore power and infrastructure like emergency communications. The City of Dallas said in a statement it will set up a “mega shelter” at its convention centre to house 5,000 evacuees. Harvey was set to dump more rainfall on the Houston area. Some parts of Houston and its suburbs could get as much as 1.3 metres of rain in total, which would be the highest amount ever recorded in Texas, the U.S. National Weather Service said. Average rainfall totals will end up around one metre. “The breadth and intensity of this rainfall is beyond anything experienced before,” the NWS said in a statement. The storm was forecast to remain for several more days, drenching parts of the region with a year’s worth of rain in the span of a week. The NWS said the exact path of the storm was uncertain but that peak flooding was expected on Wednesday and Thursday as rivers crested. 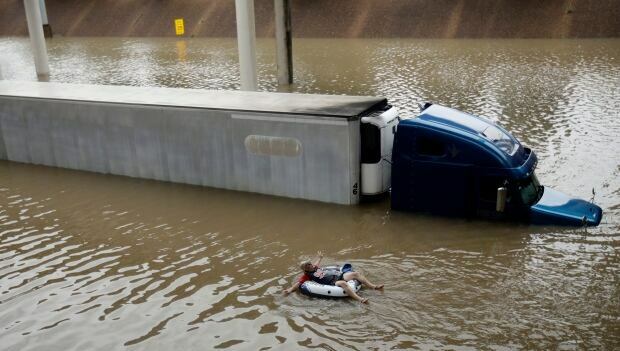 The agency issued flood watches and warnings from near San Antonio to New Orleans. One of Canada’s newest astronauts, who is training in Houston, posted photos to social media of flooded streets. “Feeling like an ant in an anthill today,” Joshua Kutryk said on Twitter. Elaine Duke, acting head of the Department of Homeland Security, said her department has made “every resource available” to deal with the storm. “People need help, and we are working to provide it,” she said Monday. Long said while Houston had seen the worst flooding, between 30 and 50 counties in the state were affected. President Donald Trump was expected to visit Texas on Tuesday. On Monday, Trump issued a federal emergency declaration for parts of Louisiana after a request by Gov. John Bel Edwards, who is expecting dangerous flooding in his state. ​Costs of the damage were still being assessed as the storm continued, but one of the world’s largest reinsurers on Monday said damages from Harvey are estimated to be well below those from major storms that hit New Orleans and New York. Hannover Re said that insured losses for Katrina in 2005 were around $ 80 billion US, while losses from Sandy in 2012 were $ 36 billion. “We are far from Katrina and Sandy in magnitude in the case of Hurricane Harvey,” a spokeswoman for the company said.